Not to be confused with a stationary point where f'(x) = 0, or with fixed-point arithmetic, a form of limited-precision arithmetic in computing. In mathematics, a fixed point (sometimes shortened to fixpoint, also known as an invariant point) of a function is an element of the function's domain that is mapped to itself by the function. That is to say, c is a fixed point of the function f(x) if f(c) = c. This means f(f(...f(c)...)) = fn(c) = c, an important terminating consideration when recursively computing f. A set of fixed points is sometimes called a fixed set. Not all functions have fixed points: for example, if f is a function defined on the real numbers as f(x) = x + 1, then it has no fixed points, since x is never equal to x + 1 for any real number. 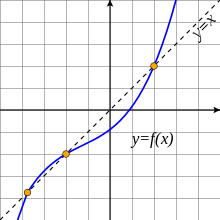 In graphical terms, a fixed point x means the point (x, f(x)) is on the line y = x, or in other words the graph of f has a point in common with that line. In Galois theory, the set of the fixed points of a set of field automorphisms is a field called the fixed field of the set of automorphisms. 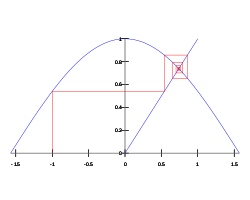 The fixed point iteration xn+1 = cos xn with initial value x1 = −1. converges to x0. An expression of prerequisites and proof of the existence of such solution is given by the Banach fixed-point theorem. Attractive fixed points are a special case of a wider mathematical concept of attractors. An attractive fixed point is said to be a stable fixed point if it is also Lyapunov stable. A fixed point is said to be a neutrally stable fixed point if it is Lyapunov stable but not attracting. The center of a linear homogeneous differential equation of the second order is an example of a neutrally stable fixed point. Multiple attractive points can be collected in an attractive fixed set. In many fields, equilibria or stability are fundamental concepts that can be described in terms of fixed points. Some examples follow. In economics, a Nash equilibrium of a game is a fixed point of the game's best response correspondence. John Nash exploited Kakutani’s fixed point theorem for his seminal paper that won him the Nobel prize in economics. In physics, more precisely in the theory of phase transitions, linearisation near an unstable fixed point has led to Wilson's Nobel prize-winning work inventing the renormalization group, and to the mathematical explanation of the term "critical phenomenon". Programming language compilers use fixed point computations for program analysis, for example in data-flow analysis, which is often required for code optimization. They are also the core concept used by the generic program analysis method abstract interpretation. In Type Theory, the Fixed-point combinator allows definition of recursive functions in the untyped lambda calculus. The vector of PageRank values of all web pages is the fixed point of a linear transformation derived from the World Wide Web's link structure. In general, the stationary distribution of a Markov chain is the fixed point of the one step transition probability function. Logician Saul Kripke makes use of fixed points in his influential theory of truth. He shows how one can generate a partially defined truth predicate (one that remains undefined for problematic sentences like "This sentence is not true"), by recursively defining "truth" starting from the segment of a language that contains no occurrences of the word, and continuing until the process ceases to yield any newly well-defined sentences. (This takes a countable infinity of steps.) That is, for a language L, let L′ (read "L-prime") be the language generated by adding to L, for each sentence S in L, the sentence "S is true." A fixed point is reached when L′ is L; at this point sentences like "This sentence is not true" remain undefined, so, according to Kripke, the theory is suitable for a natural language that contains its own truth predicate. The FPP is a topological invariant, i.e. is preserved by any homeomorphism. The FPP is also preserved by any retraction. According to the Brouwer fixed-point theorem, every compact and convex subset of a Euclidean space has the FPP. Compactness alone does not imply the FPP and convexity is not even a topological property so it makes sense to ask how to topologically characterize the FPP. In 1932 Borsuk asked whether compactness together with contractibility could be a necessary and sufficient condition for the FPP to hold. The problem was open for 20 years until the conjecture was disproved by Kinoshita who found an example of a compact contractible space without the FPP. The notion and terminology is generalized to a partial order. Let ≤ be a partial order over a set X and let f:X → X be a function over X. Then a prefixpoint (also spelled pre-fixpoint) of f is any p such that f(p) ≤ p. Analogously a postfixpoint (or post-fixpoint) of f is any p such that p ≤ f(p). One way to express the Knaster–Tarski theorem is to say that a monotone function on a complete lattice has a least fixpoint that coincides with its least prefixpoint (and similarly its greatest fixpoint coincides with its greatest postfixpoint). Prefixpoints and postfixpoints have applications in theoretical computer science. ^ Coxeter, H. S. M. (1942). Non-Euclidean Geometry. University of Toronto Press. p. 36. ^ Weisstein, Eric W. "Dottie Number". Wolfram MathWorld. Wolfram Research, Inc. Retrieved 23 July 2016. ^ Kinoshita, S. (1953). "On Some Contractible Continua without Fixed Point Property". Fund. Math. 40 (1): 96–98. ISSN 0016-2736. ^ B. A. Davey; H. A. Priestley (2002). Introduction to Lattices and Order. Cambridge University Press. p. 182. ISBN 978-0-521-78451-1.